I said I’d never be one of those people who posts photos and videos of their cat. Never, never. 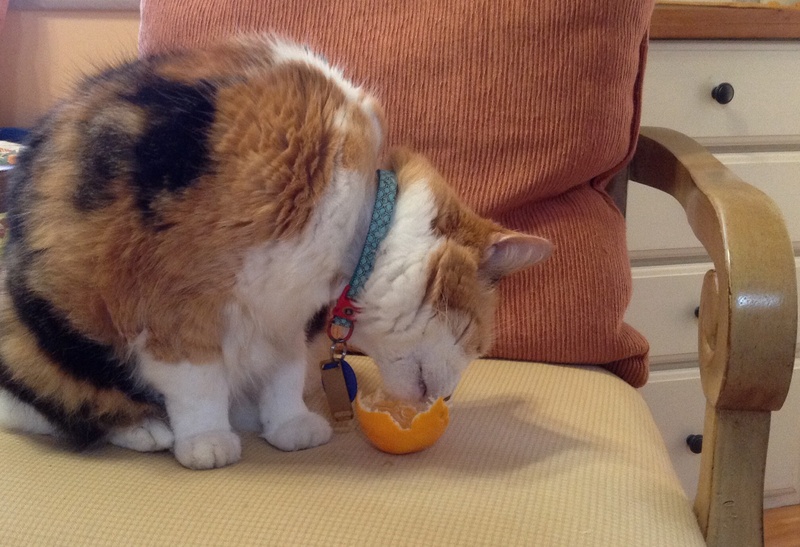 It turns out I needed only the slightest provocation, from a blog reader who wrote, “Ooh, your cat is adorable – more please!” after I posted a picture of Lili eating a papaya. She is The Cat Who Eats Anything. While her first loves are tropical fruits (bananas and papayas from our yard – I just realized she’s probably smart enough to know organic when she tastes it), she has never turned anything down: champagne, arugula, it’s all on the menu because she has a very refined palate. I’m a member of a women’s group and Lili is our honorary sixth member. Whenever the five of us gather in my living room, Lili joins the discussion on the sofa so she won’t miss a thing. I wouldn’t be surprised if she raised her paw and asked a question at some point. I’ve had lots of cats. I had a grumpy cat before Grumpy Cat was famous. 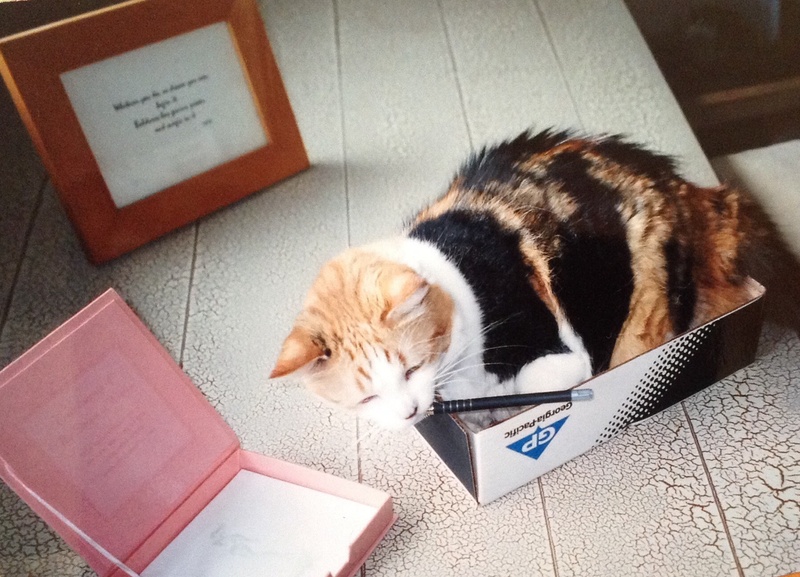 I had a tortoiseshell who was so emotionally fragile that she hid under my bed for eight hours every time the garbage truck came down the street. Then there was the male cat who was self – feeding. He could open a cabinet door by himself and tip his food container over. This never failed to amuse my mother. But none of these kitties compared to Lili. She is beyond smart, she is wise and savvy. Everyone who comes to our house wants to take her home. Lili could be an ambassador for the state of Hawaii because she is Miss Aloha. I am so glad I wandered into the Maui Humane Society the day the best, smartest cat ever was just waiting for me to take her home. I’ve thought of getting her her own YouTube channel – but would anybody really watch a cat eat absolutely anything put in front of her, the way they watch Nora the piano – playing cat play a duet? 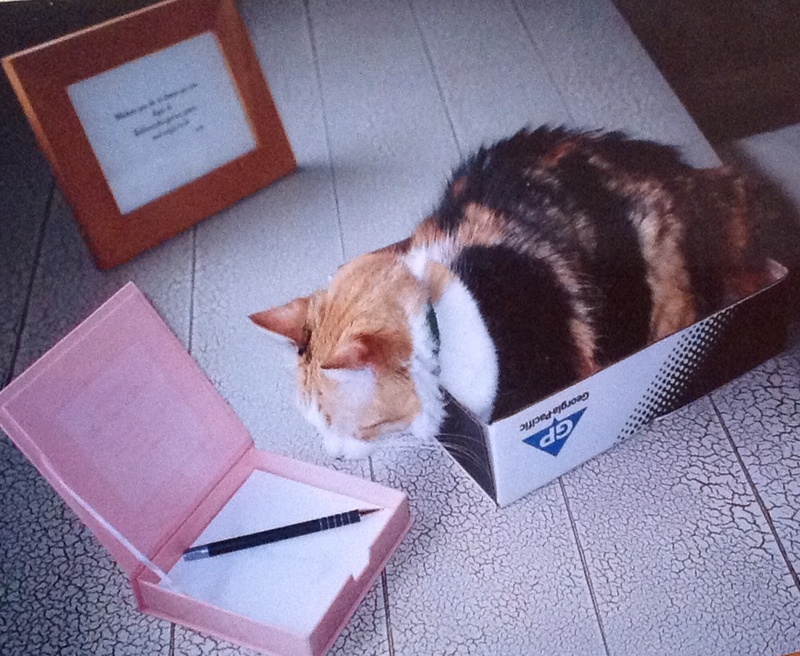 Yes, she picked up the pen by herself. What can I tell you? I will make my yearly pitch now: if you have room in your life and your heart for a(nother) fur-person, please consider visiting your local animal shelter. Who knows – you might get one who can sing or dance, or even play the piano. This entry was posted in Life in Hawaii and tagged Cat eating an orange, Guy Hagi, Nora the piano-playing cat, the cat who eats everything, vog blankets the state, VOG in Hawaii, vog in Maui by jamaicawtr. Bookmark the permalink. So loved this…love your cat! 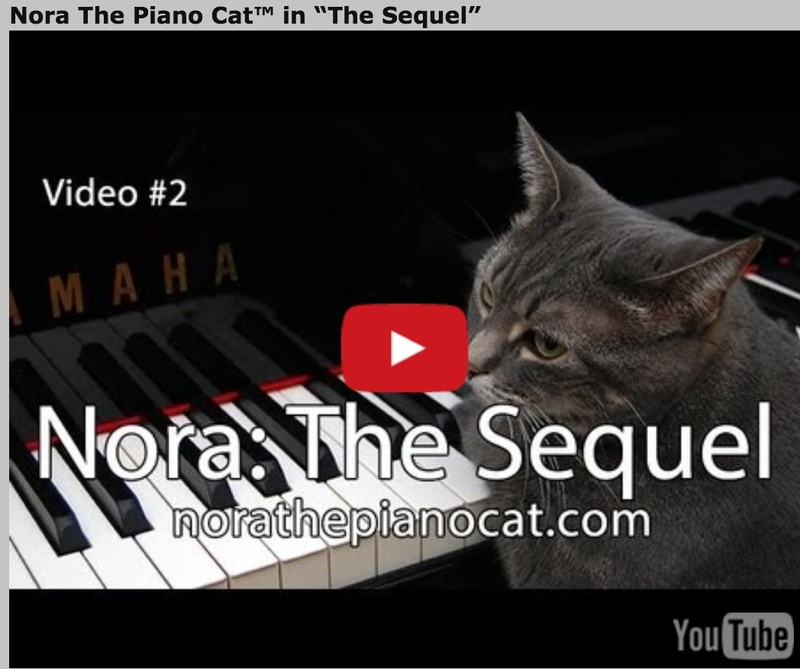 Post more she’s purrfect…loved Nora, the piano playing cat, watched all the videos!! Consider this your provocation! Lili has been auditioning for a youtube role since you adopted her. 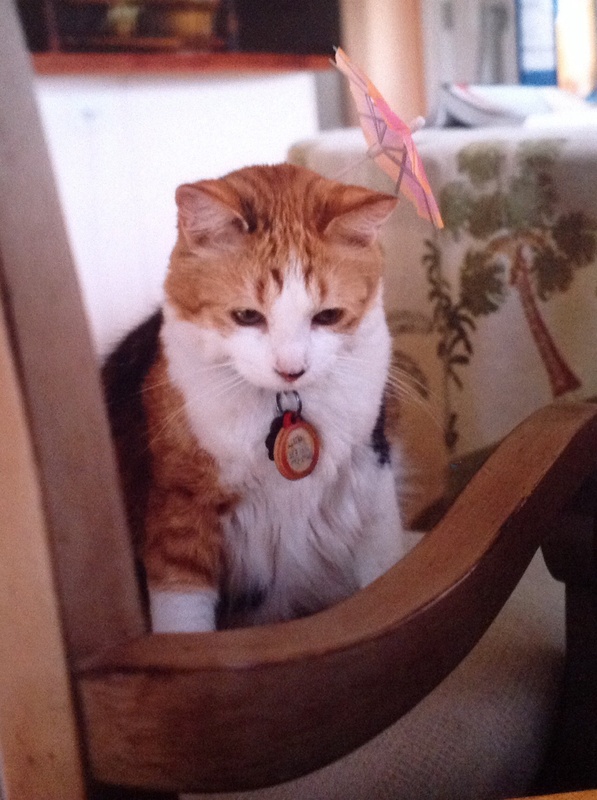 She looks so much like our beloved Mango, who owned us for 18 1/2 years before crossing over. Calico kitties are very intelligent creatures. Enjoyed seeing your girl Lili, especially liked her party hat! We can only hope our Lili lasts as long as your Mango did for you. Lili is currently very sick with a bladder infection that has traveled into her kidneys. She is on yukky liquid antibiotics and not loving life right now. We have our fingers crossed that her next test results improve.